"We can't behave like people in novels though can we?" The Age of Innocence focuses on Newland Archer and the period up to and after his marriage to May Welland. Newland works in law and as part of his job is given the difficult task of trying to convince Countess Ellen Olenska to return to Europe to her foreign husband. The divide exists between his culture's expectations, the expectations of his soon to be family (Ellen is his fiancée's cousin) and the ideas he has about equality, freedom and what is right. The writing in The Age of Innocence is superb. I've said it before but the volume of words is like treacle or syrup to me. The writing is poignant and sweet but the sentences are long and sticky: they get between your teeth. So if you like the style the writing, particularly the opening few chapters, is spectacular. But if you want more mundane classics or a less embroidered style then try something closer to Jane Austen. The Age of Innocence is in many ways a social critique and for that very reason was somewhat controversial I believe. Mainly because it suggests that an affair or something like an affair takes place. And that the character of Newland finds this perfectly acceptable. However this event is phrased in such a way that one could take it as that the relationship in the book was believed by everyone else to be an affair. In which sense the book takes on a less sordid meaning. And in such a way Edith Wharton also makes her work less scandalous. However I do not want to look at the affair or whether there was one within the book. What I do want to mention is how Edith Wharton, as she did with Ethan Frome, writes a criticism of society. Her criticism is found in how Ellen Olenska is shunned by society for her lack of etiquette and style; the fact that she wishes to become a divorced woman and that she married a foreign nobleman; and that she is an embarrassment to the 'proper way of life' in New York. Her family encourage her to return to her husband even though it is suggested that she was in some way abused by him more for the sake of propriety than because they care for her. And to achieve this end manipulation and deceit is involved. 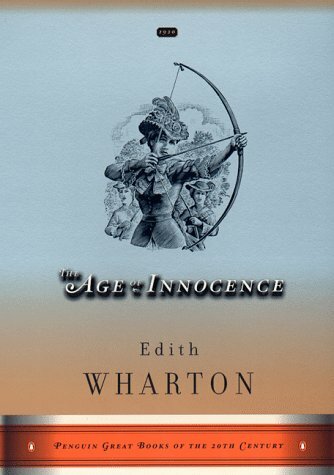 The whole premise of The Age of Innocence very much revolves around Newland discovering that the ideals he held as valuable do not hold so much value when they interfere with human lives. The fact that this society cares more for what is trendy or fashionable than what affects a person and do not care for those who fall into monetary issues makes them all hypocritical individuals. Wealthy and fashionable hypocrites but hypocrites nonetheless. In fact what I liked so much about this novel apart from the characters and the writing was how Edith Wharton challenged those ideas of the society. She threw up the idea that perhaps it did not matter who was fashionable and whether it was 'proper' to talk to a certain individual but rather what was right should prevail. As a side note the whole issue of the possible affair is pervaded to as perhaps something that could be morally justified because Newland's love was different from any other man. A justification often used and hence in my view unjustifiable. Another side note is that Edith Wharton also questions whether women should have the same ability of men and that it is wrong to judge a woman who seeks independence. Fair enough I say - someone needed to voice such opinions. Ultimately the idea that I captured the spirit of most was how the society of innocence never talked about what was improper or about indecencies like affairs. However anything improper was silently perceived and judged by the masses, hence it was an age of innocence in that no one appeared to be doing anything improper. However under the surface immorality was more rampant than it appeared. And hence Edith Wharton I believe challenges the idea of judging another individual's actions. Because perhaps it may turn out that your judgement is just as wrong as the actions undertaken by another. She also challenges a culture where deception is practiced underfoot and subtly accepted. Lies are no foundation for a society is an opinion that she implies. I fully recommend that anyone interested in classic literature read this. I would also like to draw attention to the excellent adaptation which I saw a year or two ago and prompted me to read this in the future: http://www.imdb.com/title/tt0106226/ I felt that the role of May Welland was done well by Winona Ryder and that Daniel Day Lewis performed well also as Newland. I think Michelle Pfeiffer did a decent job for what she had to act but I don't know if the character necessarily was owned by her... Either way this is a critique of the book and I merely recommend the film as a side interest. I would definitely challenge you to read this either way. "Using this version as I have an omnibus of Wharton novels. The book version I have has lots of mirth...that is The House of Mirth." "Loving the rich language (as I did with Ethan Frome). I have a penchant for those authors who make their writing sticky and thick like syrup so that you get caught up in the description and amazing word choice. \n \n My favourite quotation so far: "We can't behave like people in novels though can we."" Alright you finally convinced me to book it at the library. Now all I have to do is wait for it to come in!